The popular stock indexes are now down about -5% year to date. The popular stock indexes are now about -13% off their highs. I don’t normally include the NASDAQ since it’s so overweight the Technology sector, but it’s down -17% off its high and the Russell 2000 small-cap index is down -19%. The year started off very strong and is ending with weakness so far. 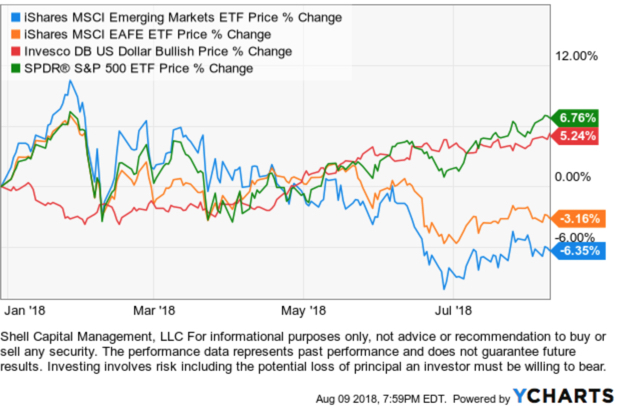 I pointed out earlier this year that Emerging Markets and Developed countries stock markets were already in a bear market if we define it as -20% off highs. Here we see they are down even more than the U.S. stocks year to date. I warned before that with interest rates rising, bonds may not provide the crutch they have in past stock market declines. That has been the case in 2018. 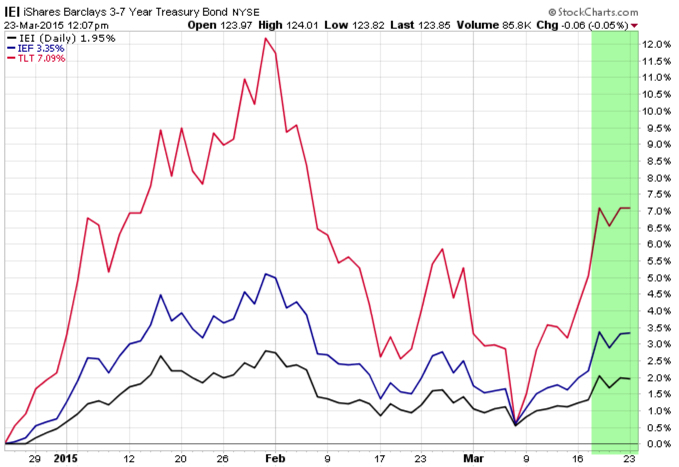 Even with the long-term Treasury gaining recently from being down -12%, it’s still down -6% year to date. Many investors are probably wondering what’s going to happen next. I said a week ago in Stock Market Observations that stocks have fallen far enough that “We would expect to see some potential buying support at these levels again.” For these popular stock indexes, they are now at the point of the February and April lows and reaching an oversold level by my momentum measures. We are looking for signs that selling pressure is drying up as those who want to sell have been exhausted and new buying demand increases to take over. 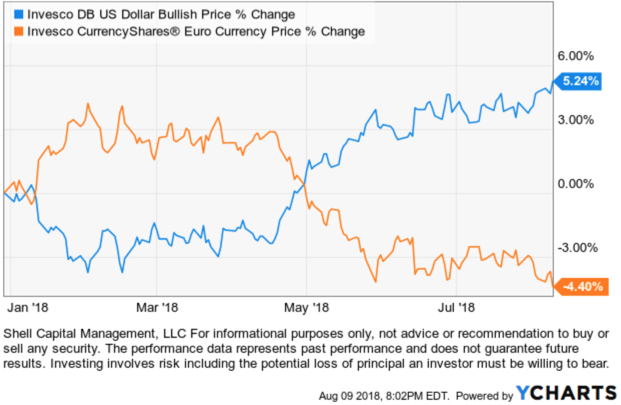 Some signs of stock prices reaching a low enough point to attract more buying than selling are observed in investor sentiment measures and breadth indicators. A simple easy to follow gauge of investor sentiment is the Fear & Greed Index, which is a composite of seven Investor sentiment measures. 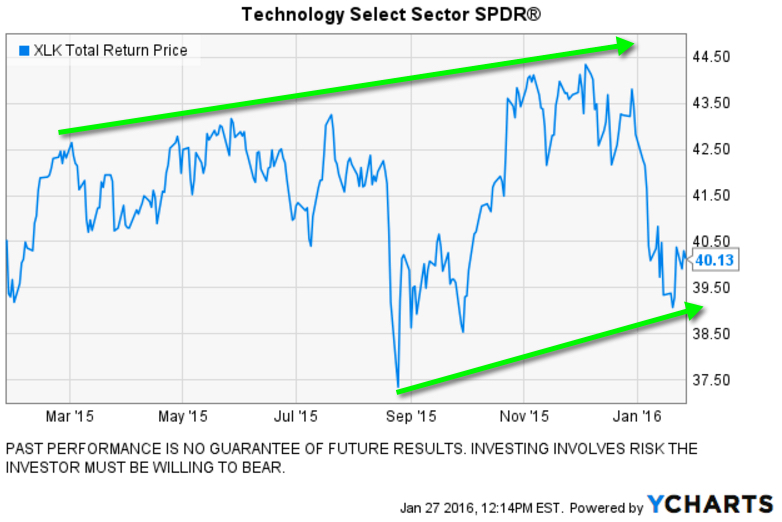 The investor sentiment reached an “Extreme Fear” zone again. Investor fear by this measure has been high for the past few months. At some point, we would expect to see those who want to sell have sold. However, if this stock trend becomes a bear market we would expect to see this gauge remain low for a long time. Although, the stock indexes will swing up and down along the way. 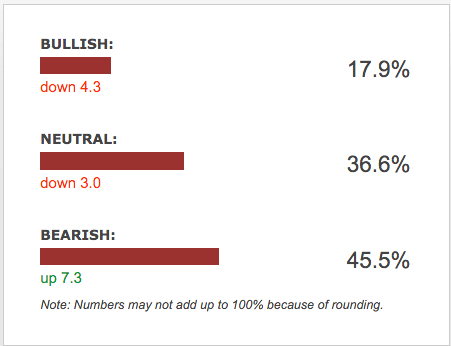 Another observation of investor sentiment reaching an extreme was last week’s AAII Investor Sentiment Survey. Last week pessimism spiked to its highest level since April 2013, while optimism fell to an unusually low level. For some historical context, the % of bearish investors has reached the high level it did at the 2016 stock market low. When investor fear reaches such extremes, it’s a contrary indicator. A bear market is a process, not an event. At -13% it’s hard to say if this will become a bear market, though there are some potential drivers that could cause stocks to fall more over time. The first warning sign for the big picture is earlier this year the Shiller PE ratio for the S&P 500 reached the second highest level ever, with data going back before 1880. The only two times the Shiller PE ratio for the S&P 500 had reached this “overvalued” level was 1929 and 1999. Of course, 1929 was followed by The Great Depression and 1999 was followed by the Tech Bubble Burst. The only time I pay attention to the PE ratio is for a big picture assessment of valuation when it reaches extreme highs or lows. At such a high level of valuation, we shouldn’t be surprised to see volatility and stocks decline. The unknown is if it keeps declining much more to reach an “undervalued” level at some point. So far, with -13% decline, the Shiller PE ratio for the S&P 500 has declined from 33 at the beginning of the year to 28 now. Twenty or higher is considered high, 10 or less is considered low. It is what it is. A bear market is a process, not an event, which means the stock market will swing up and down along the way. For example, historical bear markets are made up of swings of -10%, +8%, -14%, +10%, each swing doesn’t make a higher high, but instead prints a lower high and lower lows. The good news is, the swings are potentially tradable. However, for those tactical traders who attempt to trade them, it isn’t easy and it doesn’t always feel good. These kind of periods are volatile, so a skilled tactical trader has to increase and decrease exposure to the possibility of gain and loss. For me, predefining risk is essential, but so is holding the predetermined exposure to give a trend room to play out. Some potentially positive news is the breadth indicators suggest most stocks are participating in the downtrend. That doesn’t sound positive unless you realize as stocks get washed out on the downside the selling pressure is eventually exhausted, at least temporarily. Below is one indicator we observe to see what is going on inside S&P 500 stock index. It’s the percent of the 500 stocks in the index that are trending above their 50-day moving average. When this indicator is low, it signals stocks may be nearing a level of selling exhaustion as most of them are already in downtrends. However, if this does become an actual bear market of -20% or more, we’ll see this indicator swing up and down along with the price trend. At this point, it’s in the green zone, suggesting the stocks may be near the “washed out” area so we could see some demand take over supply in the days or weeks ahead. As you can see below, the percent of stocks above their 50 day moving average has now reached the low level it did in February and back in August 2015 and January 2016 that preceded a reversal back up. I shared my observations of this breadth indicator back in February when I explained it in more detail if you want to read it Stock Market Analysis of the S&P 500. I also shared it in October when the current downtrend started. In October, the percent of stocks above their 200 day moving average was still high and hadn’t declined much. That isn’t the case now. As you can see, even this longer term breadth indicator is now entering the green zone. 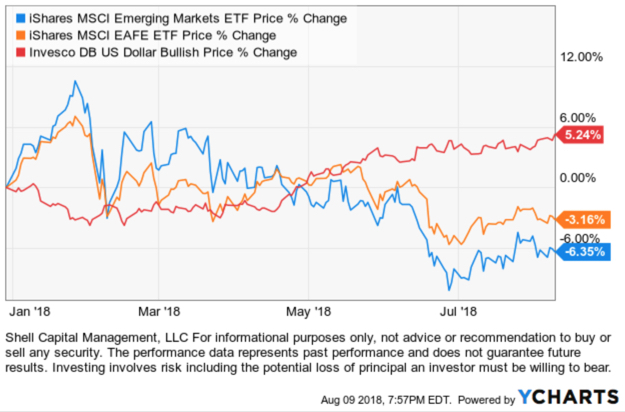 As more stocks have already declined, it becomes more and more likely we’ll see selling exhausted and shift to buying demand as prices reach lower more attractive levels for institutional investors. As you can see below, the percent of stocks above their 200 day moving average has now reached the low level much below February and now down to the levels reached in August 2015 and January 2016 that preceded a reversal back up in stocks. Another indicator that measures the participation in the trend is the S&P 500 Bullish Percent index that I have been observing for over two decades. This is the percent of stocks on a Point & Figure buy signal, which often traces a pattern something similar to the 50 day and 200-day moving averages as it has the past four years. As we see below, this indicator is reaching the low level not seen since August 2015 and January 2016 that preceded a reversal back up. At this point, we haven’t yet seen enough buying enthusiasm to overwhelm the desire to sell. But, many of these indicators I’ve been monitoring for nearly two decades are reaching a level we should see some shift at some point. If we don’t, the stock market may enter into a more prolonged and deeper bear market. However, historically lower lows are made up of cycle swings along the way, so we should still see at least some shorter-term uptrends. I’m starting to hear a lot of “bear market” talk in the news and on social media, so I thought I would put the current decline into context. My mission isn’t to take up for the stock market, but instead to present the facts of the trends as they are. I was defensive at the beginning of the year and then added more exposure after prices fell. I predefine my risk by predefining my exits in all of my positions, so any exposure I have has a relatively short leash on how low I’ll allow it to go before I cut my loss short, rather than let the loss get large. I am never a market cheerleader, but because I was already defensive near the peaks, I may have the potential to take advantage of the lower prices. I’m almost always going to be a little too early or a little too late and that is fine. It’s never been perfect but has still achieved the results I want the past two decades. To put the current decline into historical contacts, we can simply compare it to the last decline of -10% or more, which was around August 2015 and January 2016. For nearly two years, the stock index was range bound with no upside breakout. Looking closer at the % off highs, we see the late 2015 decline was -12% and the first few months of 2016 was about -15%. Here is 2018. So far, it isn’t actually as much of a decline. Another interesting observation I’ll share is the trend in the CBOE S&P 500 Volatility Index (VIX). Below is the 2015 to 2016 period again with the S&P 500 in the top panel and VIX volatility index in the bottom panel. 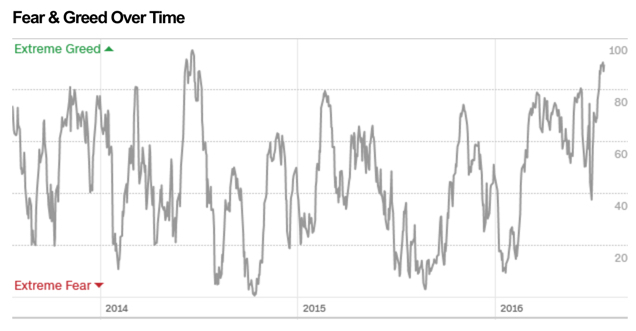 We see the VIX spiked up sharply around August 2015 when the stock market decline. However, when the stock market recovered the loss and then declined again to a lower low, the VIX index didn’t reach the same high level the second time. The volatility expansion wasn’t nearly as high even though the stock index reached an even lower low. We are observing that same divergence in volatility this year. The VIX spiked over 100% when stocks fell -12% around February this year. The stock market recovered and printed a new high in September, then has since fallen -13% from that high. This time, however, the implied volatility VIX index hasn’t spiked up nearly as high. What could it mean? When the VIX increases it is an indication of expected future 30-day volatility implied by the options on the stocks in the S&P 500. When the VIX increases, it means options traders are probably using options to hedge against market declines. I’m guessing it could signal that hedging and possible selling enthusiasm could be drying up. That seems to be what it suggested in 2015 to 2016 when it did the same, then the stock market trended up into 2017. We’ll see how it all unfolds from here, but the stock market has clearly reached an inflection point. 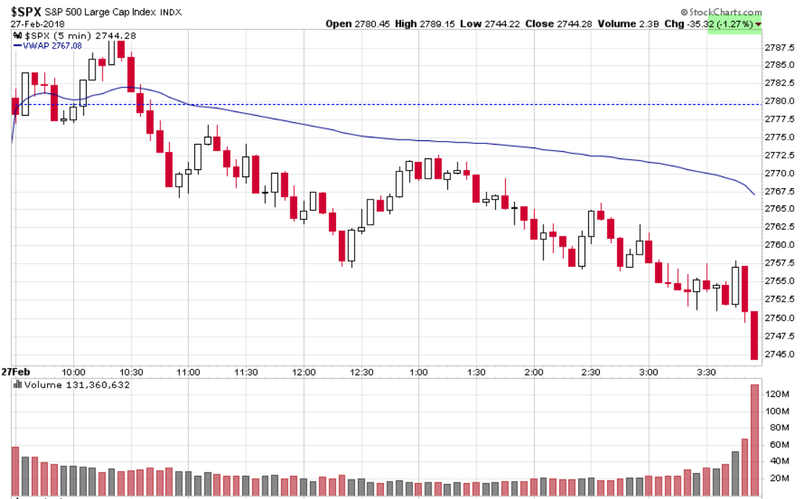 Stocks have trended down to a low enough level we should see some buying demand if it’s there. You can probably see why I believe markets require me to actively manage my risk through predefined exits and hedging to extract from it the asymmetric risk-reward I want. Volatility is a measure of the frequency and magnitude of price swings up and down in a market or stock over a period of time. Lower volatility is when prices are calmer and don’t swing up and down as much. Higher volatility is when price movement spreads out, and prices swing up and down in a wider range. Realized Volatility: based on actual historical price data. For example, we can see realized volatility by looking at historical standard deviation or average true range. Implied Volatility: is a measure of expected future volatility that is implied by option prices. For example, the VIX Index is a measure of expected future volatility. The VIX Index measures the market’s expected future volatility based on options of the stocks in the S&P 500® Index. 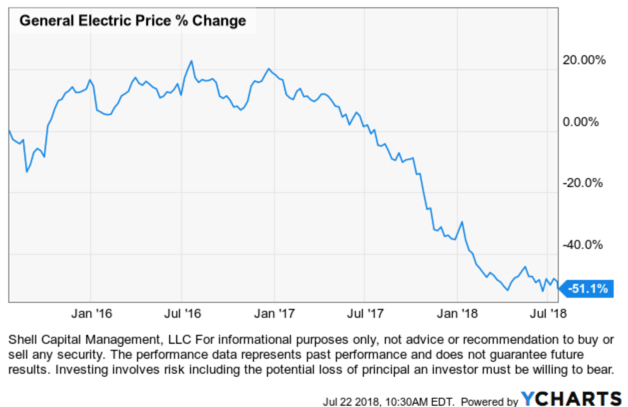 The VIX Index estimates expected volatility by aggregating the weighted prices of S&P 500 Index put and call options over a range of strike prices. The last observation I shared of the trend and level of VIX was VIX Trends Up 9th Biggest 1-day Move. I pointed out the VIX level had been very low, and it was an observation of complacency. The VIX spiked up nearly 300% – a volatility expansion. Actually, we could call it a volatility explosion. The current level of the VIX index has settled down to a lower historical level suggesting the market expects the future range of the price of the S&P 500 to be lower. Below is the current level relative to the past year. Looking at the current level of 12 compared to history going back to its inception in 1993, we observe its level is indeed near its lowest historical low. 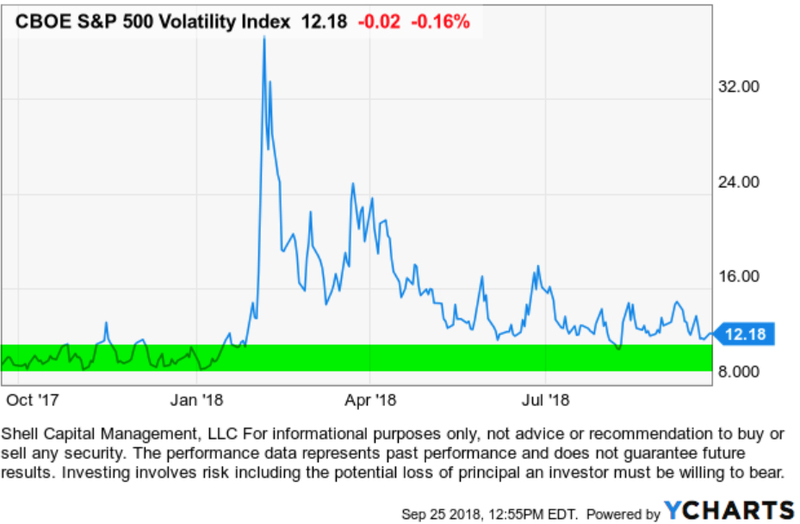 The VIX Index is intended to provide a real-time measure of how much the market expects the S&P 500 Index to fluctuate over the next 30 days. The VIX Index reflects the actual order flow of traders. 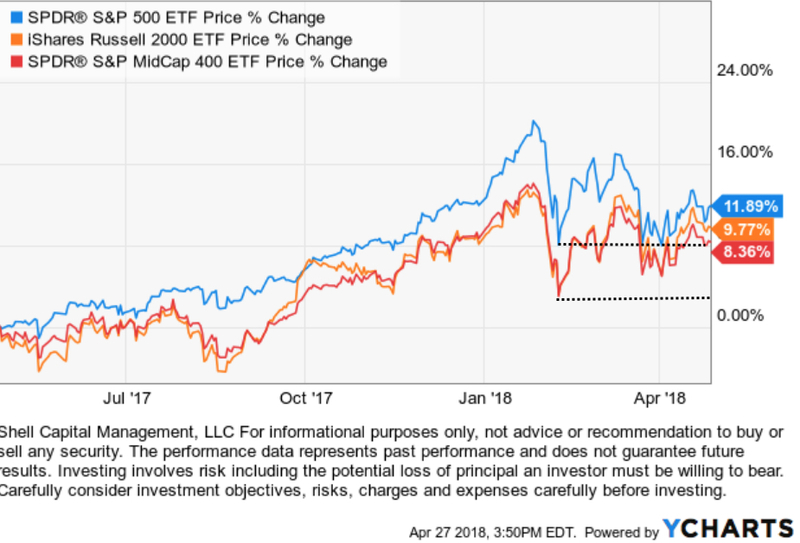 Since investors tend to extrapolate the recent past into the future, they usually expect recent calm markets to continue and violent swings to persist. 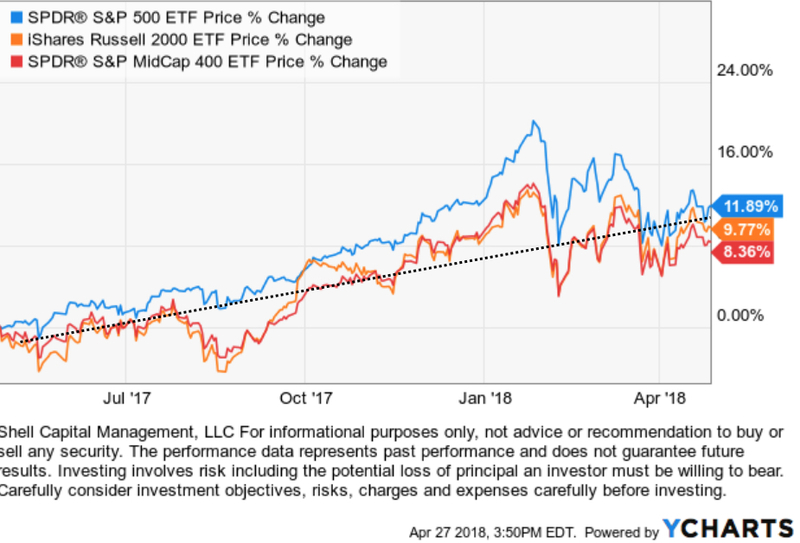 After the stock market declines and volatility expands, investors extrapolate that recent experience into the future and expect volatility to continue. Sometimes it does continue, but this time it gradually declined as the price trend became calmer. 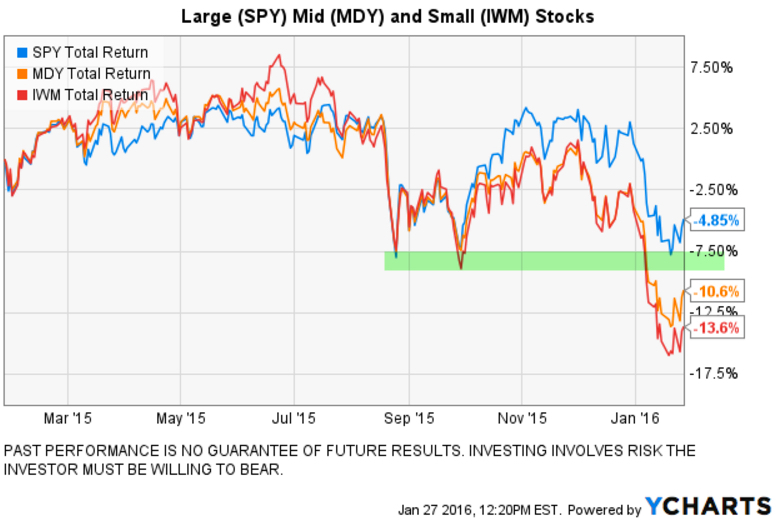 When markets have been calm, traders and investors expect volatility to remain low. Before February, the VIX implied volatility had correctly predicted low realized volatility for months. 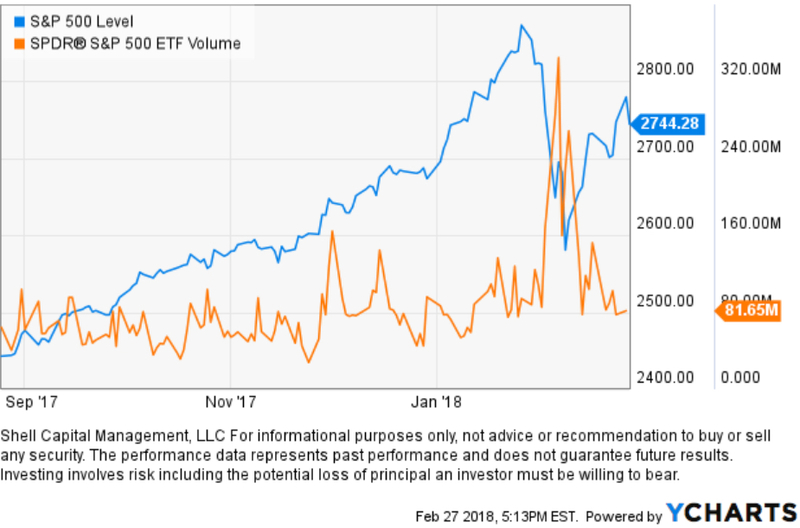 But, both realized and expected volatility was so low that many investors were shocked when stock prices fell sharply, and volatility expanded. When the market expects volatility to be low in the next 30 days, I know it could be right for some time. But, when it gets to its historically lowest levels, it raises situational awareness that a countertrend could be near. It’s just a warning shot across the bow suggesting we hedge what we want to hedge and be sure our risk levels are appropriate. The AAII Investor Sentiment Survey is a widely followed measure of the mood of individual investors. 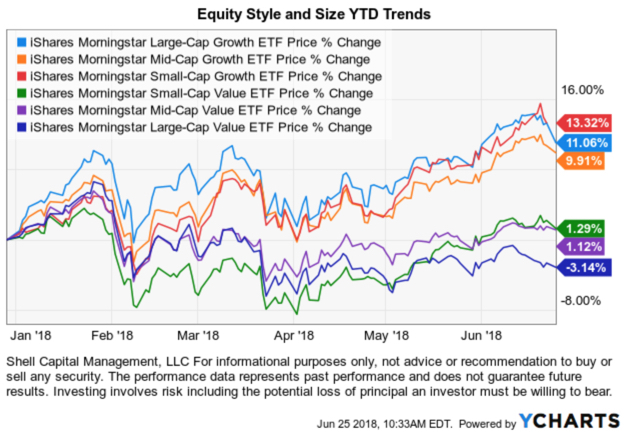 The weekly survey results are published in financial publications including Barron’s and Bloomberg and are widely followed by market strategists, investment newsletter writers, and other financial professionals. It is my observation that investor sentiment is trend following. 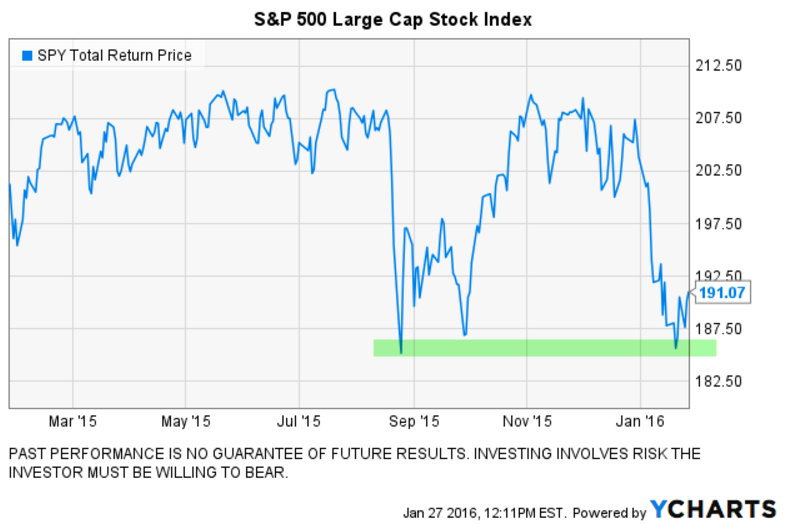 Investor sentiment reaches an extreme after a price trend has made a big move. After the stock market reaches a new high, the media is talking about and writing about the new high, which helps to drive up optimism for higher highs. When they get high, they believe they are going higher. At the highest high they are at their high point — euphoria. No, I’m not talking about cannabis stocks, I’m just talking about the stock market. Cannabis stocks are a whole different kind of high and sentiment. A few years ago, I would have never dreamed of making a joke of cannabis stocks or writing the word marijuana on a public website. Who had ever thought there would be such a thing? But here I am, laughing out loud (without any help from cannabis). Excessive investor sentiment is trend following – it just follows the price trend. Investor sentiment can also be a useful contrarian indicator to signal a trend is near its end. As such, it can be helpful to investors who tend to experience emotions after big price moves up or down. Investor sentiment can be a reminder to check yourself before you wreck yourself. 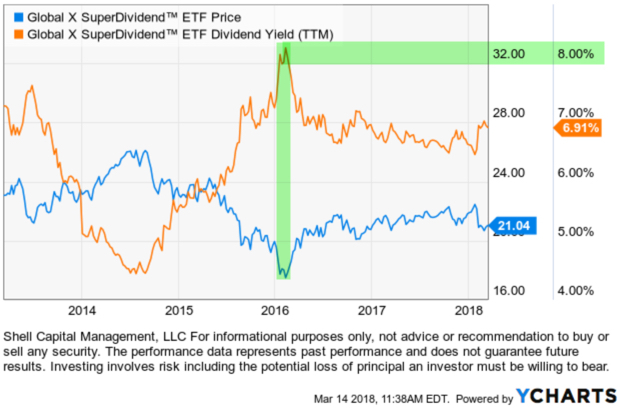 Investor sentiment can be a reminder to a portfolio manager like myself to be sure our risk levels are where we want them to be. Although… rising investor optimism in its early stages can be a driver of future price gains. Falling optimism and rising pessimism can drive prices down. So, I believe investor sentiment is both a driver of price trends, but their measures like investor sentiment polls are trend following. For example, below I charted the S&P 500 stock index along with bullish investor sentiment. 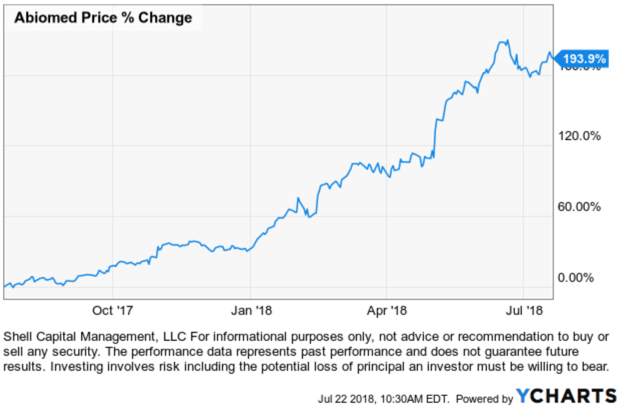 We can see the recent spike up to 43% optimistic investors naturally followed the recent rise in the stock price trend. However, in January we observed something interesting. Investor sentiment increased sharply above its historical average in December and peaked as the stock market continued to trend up. Afterward, the stock market dropped sharply and quickly, down around -12% very fast. Maybe the investor sentiment survey indicated those who wanted to buy stocks had already bought, so there wasn’t a lot of capital left for new buying demand to keep the price momentum going. The S&P 500 is still about -2.4% from it’s January high, so this has been a non-trending range-bound stock market trend for index investors in 2018. The Dow Jones Industrial Average was last years more gaining index and it is still -6% from its high. The stock index will need some buying enthusiasm to reach its prior high. 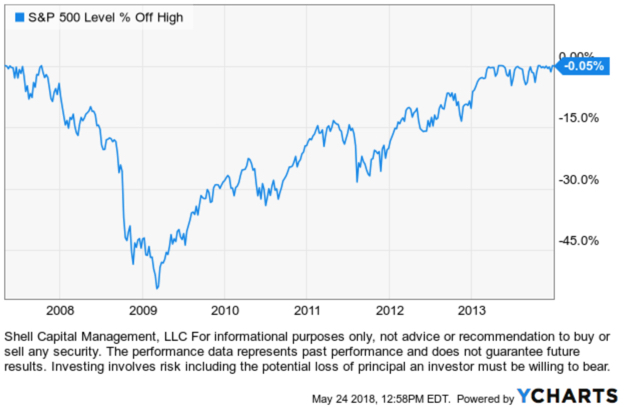 We’ll see if the recent increase in optimism above its historical average is enough to drive stocks to new highs, or if it’s a signal of exhaustion. I determine my asymmetric risk/reward by focusing on the individual risk/reward in each of my positions and exposure across the portolio. For me, it’s always been about the individual positions and what they are doing. In case you missed it, below are all of the observations we shared this week. 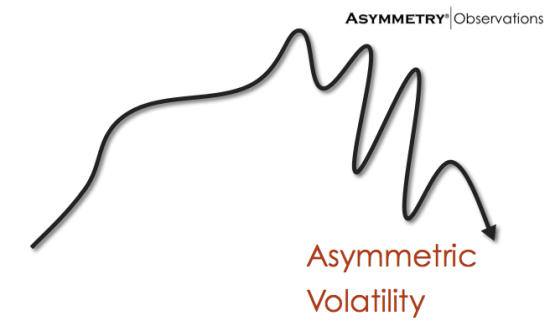 When there are more directional trend changes and volatility, I find more asymmetries to write about. That’s because I look at markets through the lens of “what has changed”? When I observe more divergence between markets and trends, I see more asymmetries to share. 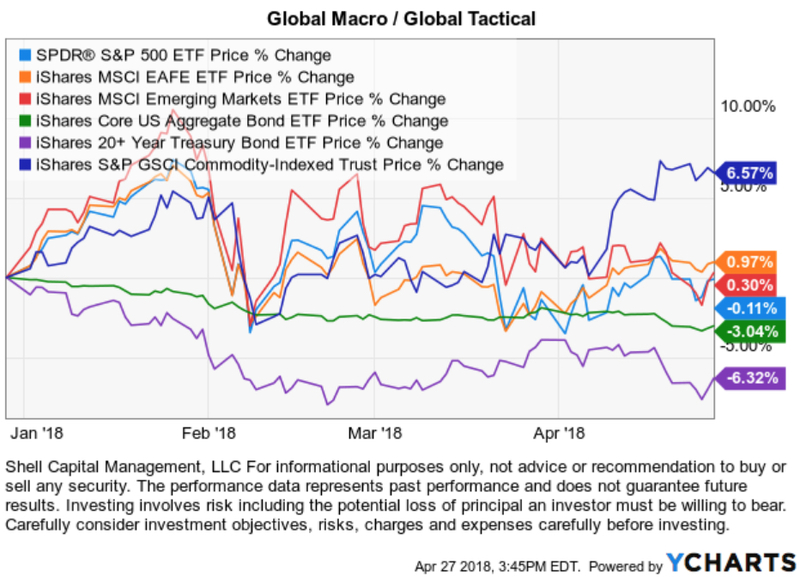 When global markets are just trending up together and quiet, investor sentiment is usually getting complacent, I typically point it out, since that often precedes a changing trend. All of it is asymmetric observations; directional trends and changes I see with a tilt. The opposite is symmetry, which is a balance. Symmetry doesn’t interest me enough to mention it. When buying interest and selling pressure are the same, the price doesn’t move. When risk equals the return, there is no gain. When profit equals loss, there is no progress. In all I do, I’m looking for Asymmetry®. I want my return to exceed the risk I take to achieve it. I want my profits to far surpass my losses. I want my wins to be much greater than my losses. I want more profit, less loss. You probably get my drift. Investor pessimism shifted to an unusually high level for the time this year. It spiked up from 24% bearish to 41%. Bearish investor sentiment is now as high as it was in April after the stock declined a second time and formed a double bottom. Interestingly, this time the stock market is only down about 6% from its high. 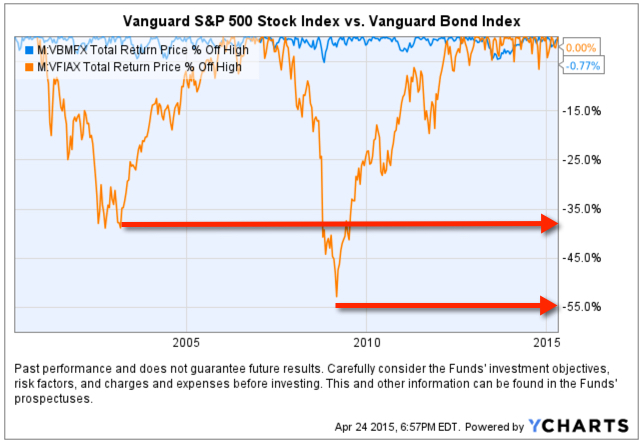 The last time investors were so bearish it had reached -10%, for the second time. 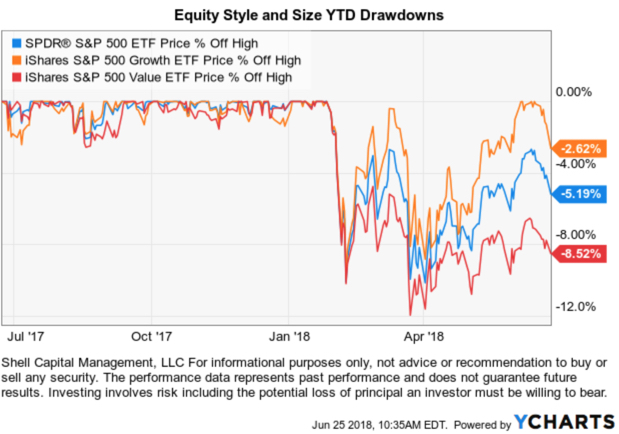 Investors may be turning more bearish more quickly since the stock market remains in a drawdown. Investors tend to feel the wrong thing at the wrong time at extremes so this could be a bullish signal. Investor optimism declined more moderately and still remains within its normal long-term range. 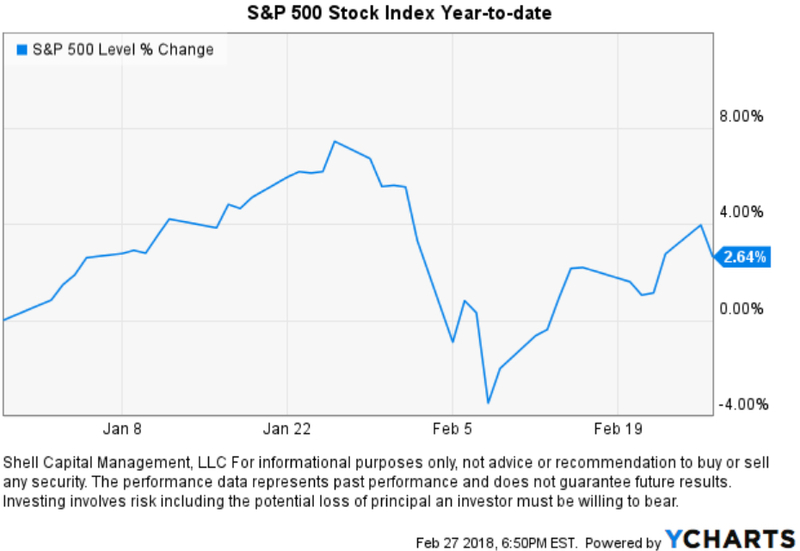 We can see how optimism trend up to an extreme in January as the stock index reached an all-time new high and investors were becoming euphoric. Investor sentiment measures show that investors do the wrong thing at the wrong time as their beliefs about future stock market returns reach the more extreme levels. A good investment program isn’t enough to help clients reach their objectives. We necessarily have to help them avoid the typical misbehavior the majority of investors fall in to. Market timing is the strategy of making buy or sell decisions of financial assets (often stocks) by attempting to predict future market price movements. The prediction may be based on an outlook of market or economic conditions resulting from technical or fundamental analysis. One reason they “can’t time the market” is they are looking at the wrong things. The first step in any endeavor to discover what may be true is to determine what isn’t. The first step in any endeavor to discover what may work is to determine what doesn’t. The gray in the chart is recessions. 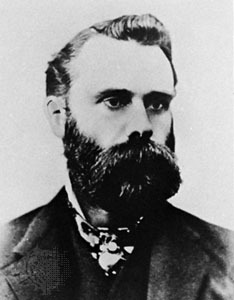 These recessions were declared long after the fact and the new recovering expansion was declared after the fact. So, the economist didn’t declare the recession until December 1, 2008, though the recession started a year earlier. In the meantime, the S&P 500 stock market index declined -48% as they waited. While the recession officially lasted from December 2007 to June 2009, it took several years for the economy to recover to pre-crisis levels of employment and output. 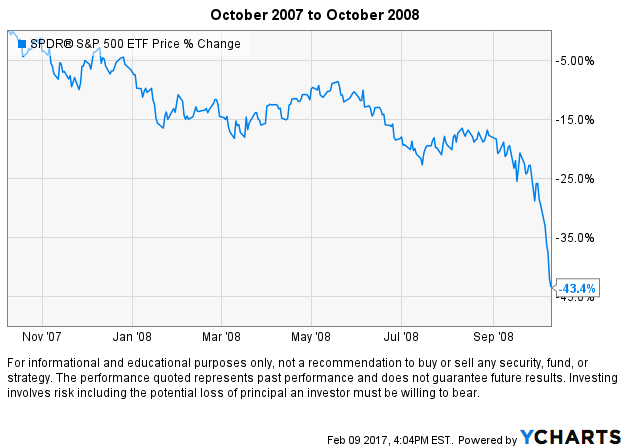 The stock market was below it’s October 2007 high for nearly six years. 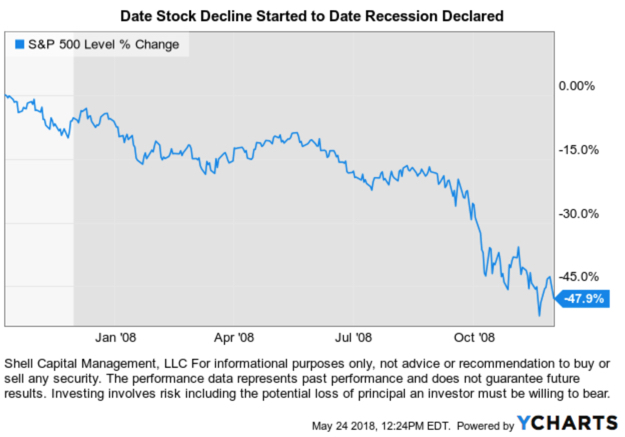 Economists declared the recession had ended in June 2009, only in hindsight do we know the stock market had bottomed on March 9, 2009. 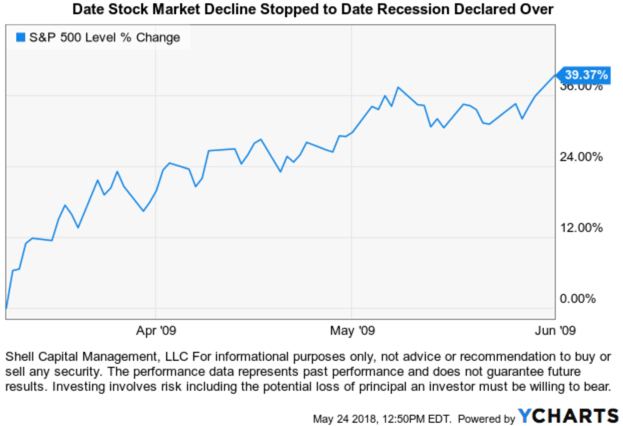 The chart below shows the 40% gain from the stock market low to the time they declared the recession over. But, they didn’t announce the recession ended in June 2009 until over a year later in September 2010. Don’t forget for years afterward the fear the economy will enter a double-dip recession. If you do believe some of us can predict a coming stock market decline or recession, it doesn’t seem it’s going to be based on the economy. Waiting for economics and economic indicators to put a time stamp on it doesn’t seem to have enough predictive ability to “time the market” to avoid a crash. I suggest the directional price trend of the stock market itself is a better indicator of the economy, not the other way around. Then, some other signals begin to warn in advance like a shot across the bow. But, for me, it’s my risk management systems and drawdown controls that make all the difference. If the U. S. Government shuts down, it will be the 19th time. Looking at the table below, it doesn’t seem a big deal. 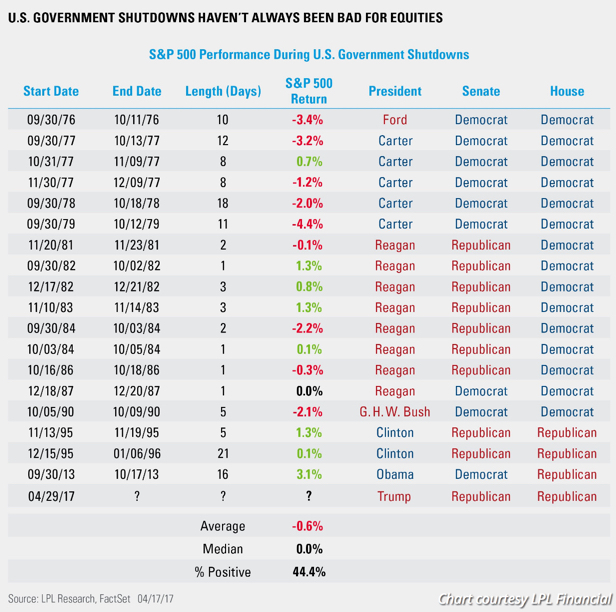 The table shows the 18 prior government shutdowns going back to 1976. It lists the start and end date of the shutdown and the gain or loss for the S&P 500 stock index. The average is only a -0.60% loss from beginning to end of the shutdown. 1. It is too small of a sample size to draw a statistically significant inference. Basic probability needs 30 data points. 2. It only shows the gain/loss from beginning and end of the shutdown. 3. It doesn’t show what happened before and after those dates. Was there more movement/drawdown before or after? 4. It doesn’t show what happened in between the start and end date so it may have been worse. 5. It doesn’t consider market stage at the time of shutdown. Was it overvalued and overbought? Or was it undervalued and oversold? The truth is; anything can happen. We don’t know for sure how it will play out. With such a small sample size of prior events and without factoring in the market conditions at the time, what it did in the past doesn’t provide us with a good expectation. 1. It will be when the U.S. stock market is at the second most expensive fundamental valuation, ever. 2. When investor and advisor bullish sentiment has reached record highs, at this point a contrary indicator. 3. As recent momentum indicators are at the highest levels ever seen before, at this point a contrary indicator. My solution? always be prepared that anything can happen. I know how much risk I’m willing to take given the possible outcomes and define my risk by knowing when I’ll hedge or exit. Mike Shell is the founder of Shell Capital and the Portfolio Manager of ASYMMETRY® Global Tactical. What do wealthy people do differently? I thought I would just sit here and write it out. These are my own observations over a few decades. I’m going to define “wealthy” as someone who has already achieved “freedom”. Notice I said “freedom”, not just “financial freedom”. I’ve asked thousands of people over the past two decades “what is important about money to you?”. Ultimately, the question leads to one single word: “freedom”. So, there doesn’t seem to be a need to add “financial” in front of “freedom”. But, that isn’t to say you can’t have plenty of money without much freedom. You could say “Some people have far more money than they ever need but they still don’t enjoy their freedom because they keep working for more”. You may consider that person is still getting what they want. Some people just want to produce, and they never stop. They are still free. They have the freedom to keep doing what they love doing. In fact, some wealthy people are driven to create more wealth for a charity. No matter what our goals are in life, traveling, relaxing, time with family and friends, helping others, having enough capital to do what we want seems essential. Having enough money to do what we want, when we want, seems to be the primary goal of most of us. So, I define “wealthy” as someone who has already achieved “freedom”, regardless how he or she chooses to enjoy his or her freedom. What do these people do differently than those who haven’t accumulated enough capital to say they are “wealthy”? 1. They save and invest money. The first thing that I have observed is that they simply save part of their income and invest it. a. Save: They save it because they don’t spend more than they should. They save a large amount of themselves to use later. Even if they earn $X a year, they don’t the most they can for their home or carts. For example, a person earning $1 million a year may live in a $1 million neighborhood and a neighbor who earns $200,000 a year. Who do you think will be “wealthy”? One is stretched, the other is saving. b. Invest: People who achieve “freedom” and the “wealthy” status don’t stop and just saving money in a bank account, they invest it. Wealthy people take the time to invest their money. Most of them invest with an investment manager who is fully committed to investment management. 2. Wealthy people care about their money. I know a lot of wealthy people, and I know just as many who aren’t. Those who are wealthy save and invest money, those who don’t spend it. As investment management clients, wealthy families are the first to complete forms, etc. as needed because they care about their money. They also appreciate investment managers who are on top of things as they would be. 3. Wealthy people are focused on that ONE thing they do best. Just like the book The ONE Thing: The Surprisingly Simple Truth Behind Extraordinary Results says: they are focused. If they are a Physician, they focus on being a great Physician. If they own a company, they focus on their business. If they are a country music artist, they focus on being the best they can be. If they are an engineer, that’s their focus. They do what they do best and they find other people to do the things they don’t want to do like lawn maintenance or whatever. If you want to earn more money to save and invest, focus on what earns you the most and pay others for the things you aren’t so great at or don’t want to do. 4. They take some risks and manage their risk. To achieve wealth, we have to be both risk-takers and risk managers. If we take no risks in life, we’ll have no chance of reward. Not graduating from college has some risks, but so does attending. Who we marry, how we title our assets, how we insure our assets, and how we manage our assets all have risks and the potential for reward. Wealthy people tend to take risks in that one thing they are best at. They go “all in”. But wealthy people also direct and control their risks. They try to take good risks that are worth taking. It doesn’t matter how much wealth we accumulate if we aren’t able to keep it. For example, many people can remember how much wealth they created on paper up to 2000 only to see it cut in half. They did it again up to 2007 through 2009, and it took years to break even. Wealthy people know to realize a real profit, you have to take a profit. To avoid a large loss, we have to cut losses off at some point. Proper planning and risk management are essential. 5. Everything is relative, but yet it isn’t to them. I know business owners as well as Physicians who I consider wealthy as well as musicians, and athletes. But, you don’t have to earn $500,000 a year all your life to become wealthy. You don’t have to earn it all in a short time, either. I know people who have a total $500,000 invested who are wealthy. They have “enough”, for them. Depending on the lifestyle, others may not become wealthy until they have over $5 million if they spend a few hundred thousand a year traveling, etc. I also know families with several hundred million. Everything is relative, but wealthy people don’t compare their wealth and assets to others. They aren’t “keeping up with the Joneses”. People who do that often have large debts because they buy things they can’t afford with money they don’t have. Or, they save and invest less. Wealthy people don’t buy a new car or house because their friend does, or compare their investment account to others. Wealthy people may be more introverted when it comes to personal finance – their focus is on their own family needs. What do the wealthy do differently? They discover how much capital they need to enable the freedom to do what they want when they want, whatever that may be. Income alone, or the neighborhood we live in, or the cars we drive, or memberships don’t signal that we are wealthy. Some wealthy people are still operating their business, practice, or “working”. A distinction is that they want to and they could choose to do something else with their time if they want. 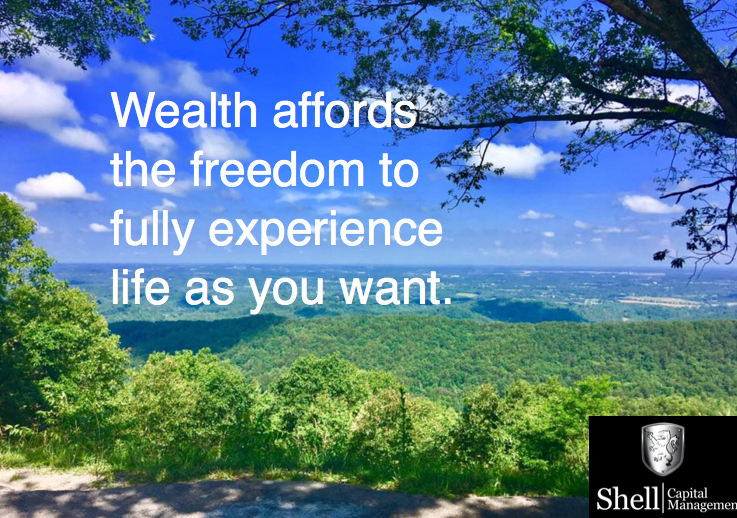 Wealthy families have saved and invested enough money to have achieved freedom. To do that, they focus on the thing they do best. They delegate the other stuff to someone else. They care about accumulating and managing their money and managing their risks. They appreciate investment managers and wealth managers who help them do it. In “Relative Strength can be a source of conflict for Tactical Traders” I explained how two different momentum indicators are in conflict with each other and can lead to conflict in tactical trading decisions. Tactical traders may use many different indicators and methods to determine whether to enter, hold, or exit a position. If we look at two conflicting indicators like this, we have to avoid becoming conflicted ourselves. To avoid the conflicts, define clearly what they are and how to use them. To do that, I’m going to mix up a bowl of Physics and Psychology. Newton’s first law of motion states that “An object at rest stays at rest and an object in motion stays in motion with the same speed and in the same direction unless acted upon by an unbalanced force.” Objects tend to “keep on doing what they’re doing.” In fact, it is the natural tendency of objects to resist changes in their state of motion. This tendency to resist changes in their state of motion is described as inertia. Inertia: the resistance an object has to a change in its state of motion. We can say the same about investor behavior and beliefs when we look at confirmation bias. Confirmation bias is the tendency to search for, interpret, favor, and recall information in a way that confirms one’s preexisting beliefs or hypotheses. Investor and trader behavior and Confirmation Bias seems to agree with the first law of motion. You can probably see how we may develop our beliefs because of our environment. If we observe over time the natural tendency of objects to resist changes in their state of motion then we may expect a trend to continue. Newton’s conception of inertia stood in direct opposition to more popular conceptions about motion. The dominant thought prior to Newton’s day was that it was the natural tendency of objects to come to a rest position. Moving objects, so it was believed, would eventually stop moving; a force was necessary to keep an object moving. But if left to itself, a moving object would eventually come to rest and an object at rest would stay at rest; thus, the idea that dominated people’s thinking for nearly 2000 years prior to Newton was that it was the natural tendency of all objects to assume a rest position. So, up until Newton’s first law of motion, people believed trends would eventually end instead of continue. In that same way, some people look for and expect recent price trends to change rather than continue. We have discovered two different beliefs. A trend in motion will stay in motion with the same speed and direction (unless acted upon by an unbalanced force). A trend will eventually stop moving (a force is necessary to keep an object moving). A Tactical Trader using Relative Strength based on the rate of change assumes that trend speed and direction will continue into the future. This is more in agreement with Newton’s first law. A Tactical Trader using the Relative Strength Indicator, an oscillator, assumes that trend speed and direction will oscillate between a range. 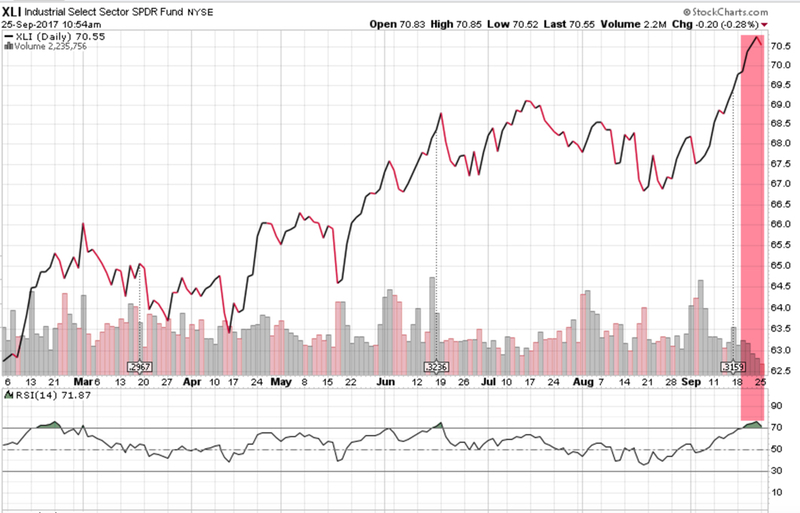 If it reaches “oversold” it may reverse back up and if it reaches “overbought” it may reverse back down. This is more like the Physics beliefs prior to Newton’s first law when they expected a trend or motion to change. To avoid conflicts between these two concepts and indicators, I define them separately as Trend Following and Countertrend. Trend Following systems are methods that aim to buy securities that are rising and sell securities that are declining. Trend following is directional – it focuses on the direction of prices. Not all measures of Relative Strength are directional, but the one I used is. 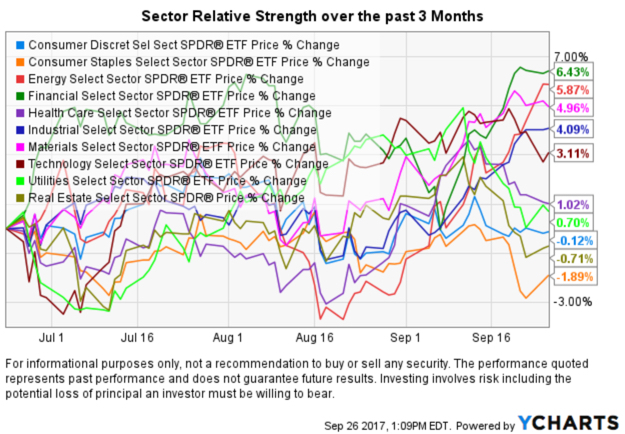 I simply ranked the sectors based on their price change over 3 months. That is an absolute ranking, but also a relative ranking. I may require the price change to be positive to enter a position. Some Relative Strength methods are only relative, so they don’t require a positive trend. They may enter the sectors that have a better price change over the period even if it’s negative. 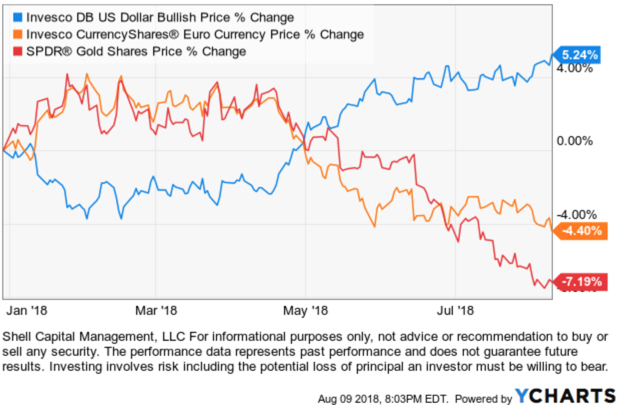 Countertrend systems aim to bet against the recent price trend for the purpose of pursuing a capital gain or for hedging. In a strongly rising market, a countertrend strategy may believe the price is more likely to reverse. For example, the RSI is “overbought.” In a declining market, a countertrend strategy may indicate the trend is likely to reverse back up. For example, RSI is “oversold.” The risk is, an oversold market can keep trending lower and an overbought market may keep trending up! I believe there are directional trends that are more likely to continue than to reverse – so I apply Trend Following to them. 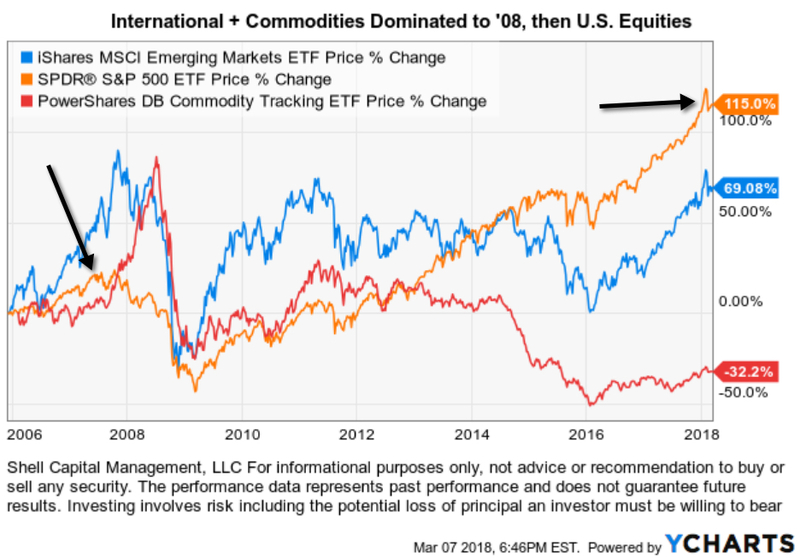 That necessarily means I believe investors may underreact to new information causing the price trend to drift gradually over time to match supply and demand. I also believe that trends can reach an extreme, especially in the short run, by overreacting to information or extremes in sentiments like fear and greed. Because I have observed trends reaching an extreme, I may apply overbought and oversold methods for countertrend trading. I combine the two, rather than them necessarily being in conflict with each other. I believe the high RSI number is confirming the strong trend, but I also believe it suggests it may not be the best entry point if you care about entering a position that may decline a few percent after you enter it. So, I believe both of these systems can be applied at different times depending on the market state of the trend type. When a price trend is oscillating up and down over time but not necessarily making a major new high or low, a Countertrend method may capture profits from those swings. When a trend is moving up or down for a prolonged period that same Countertrend system may catch some of the profits and miss some as well. That is because it expects the trend to reverse at certain points and it doesn’t. However, a Trend Following system may better capture the overall trend when it keeps trending. But, none of them are perfect. If a Trend Following system captures the bigger trend it also means it will likely participate in a drawdown when the trend does end. If the Trend Following algorithm is loose enough to ride the trend without whipsaws, it will also be loose enough to lose some gains when the trend does change to the other direction. If Tactical Traders and investors have useful definitions like these and can apply these different methods to different types of markets, with the right mindset and expectations we can avoid the conflicts. Someone was talking about how much the stock market is “up”. However, it’s the exit that determines the outcome. When someone talks about being “up” that doesn’t mean anything unless they have sold to realize the profit. If they haven’t sold, it’s the markets money. The market may giveth, but it can also taketh away. Market gains are just market gains. To realize a profit, we have to sell. Open profits aren’t yet realized. Open profits may never be realized. Open profits may be evaporated by later losses. Closed profits are ours. When we exit and take a profit, we’ve realized the gain and have the cash to show for it. To be sure, let’s look at the last 20 years. It’s hard to believe that a data point of 1997 is now 20 years ago! It seems like yesterday to me. Talking about 1997 may sound ancient now, but it wasn’t so long ago. 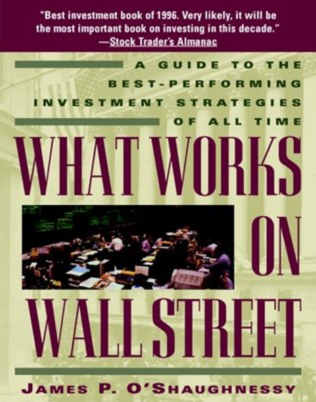 The late 1990’s was one of the strongest cyclical bull markets in history. The S&P 5oo stock index gained over 200% in five years! The sharp gains of the late 1990’s inspired even the oldest bank savers to cash in CD’s that were paying 5% to 7% for the chance for high profits. Only in hindsight do we know what happened next. The essential concept investors must understand is not only how capital compounds, but also the math of loss. Losses are asymmetric. In fact, losses are more asymmetric than gains. That is, losses compound more exponential than gains. Losses are exponential. As they get larger, it takes more gain to recover the loss to be back to even. That’s why we don’t have to capture 100% of a gain to result in the same or better return if the downside loss is limited. When we avoid much of the downside, we simply don’t need to risk so much on the upside to compound capital positively. And, if we don’t have large losses on the downside investors are less likely to tap out with losses. Those concepts are essential to understand. It doesn’t matter how much the return is if the downside is so large they tap out before the gain is realized. In the chart below, we can see how the math works. A -10% loss takes +11% to recover. A 20% loss takes +25% to recover. Beyond -20%, the losses become more asymmetric and exponential. A -30% loss needs a +43% to get back to even. At -40% you need +67% to regain. That’s why losses in the -50% range as we’ve seen twice over the past 15 years are so devastating to life plans. At -50% you need +100% just to recover the loss and get back to breakeven. If your loss is -60%, it’s +150% to recoup. 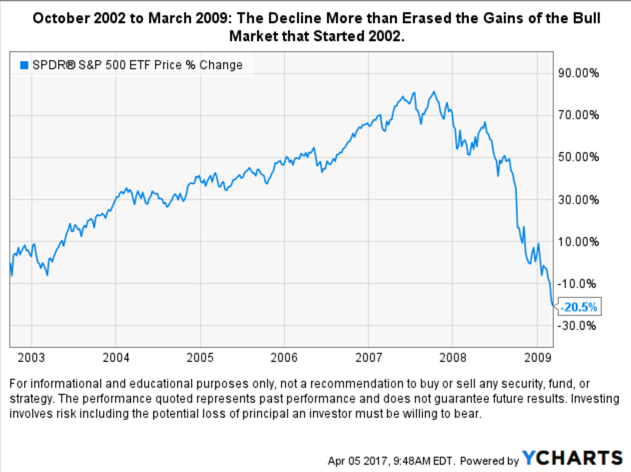 So when you hear people bragging about the stock market gains since 2009, don’t forget the other side of the story. It’s the other side the makes all the difference. How many years of staying fully invested in risky markets did it take to recover the loss? Let’s look at how this matches up with real price trends we’ve observed over the past 20 years. 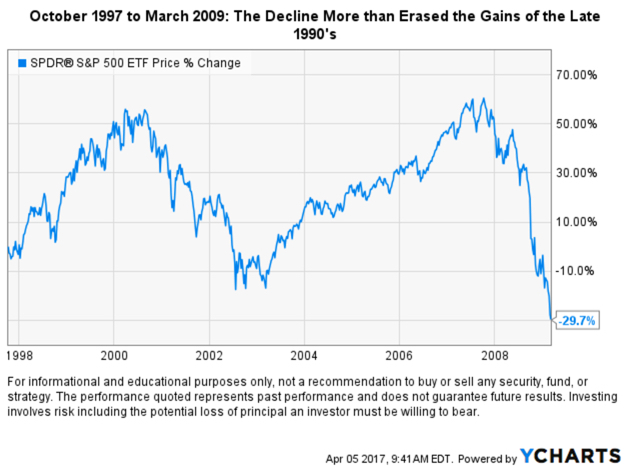 Below we see the late 1990’s gains more than erased by the sharp decline from 2000 to 2002. But keep in mind, while the decline was a sharp one at -50%, the decline was made up of many swings up and down along the way. The swings of lower highs and lower lows swayed many investors back “in” as those swings up along the way made them think the low was in and it was a “buying opportunity”. They did that just in time for the next down move. 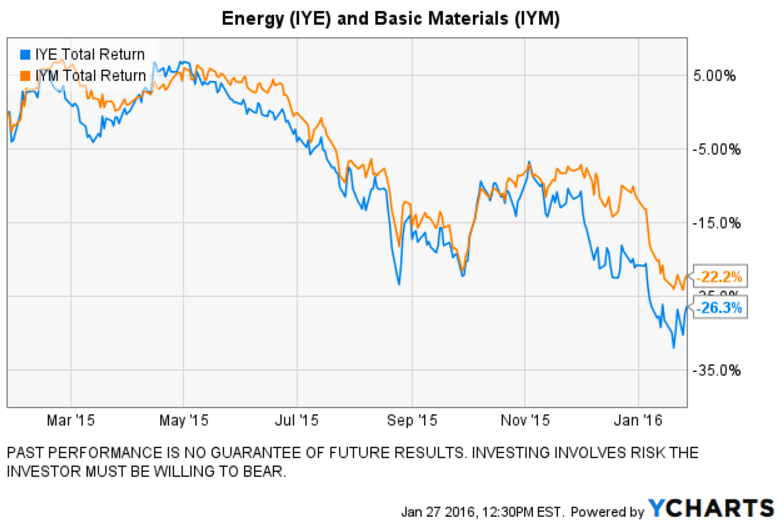 Avoiding bear markets isn’t as simple as exiting near the peak and reentering near the low. It’s far more complicated. Investors fear missing out during every 10% to 20% upswing, then they fear losing more money after every -10% to -20% downswing. But, the point here is that the large uptrend was erased by the later downtrend. What happens along the way brings additional challenges. 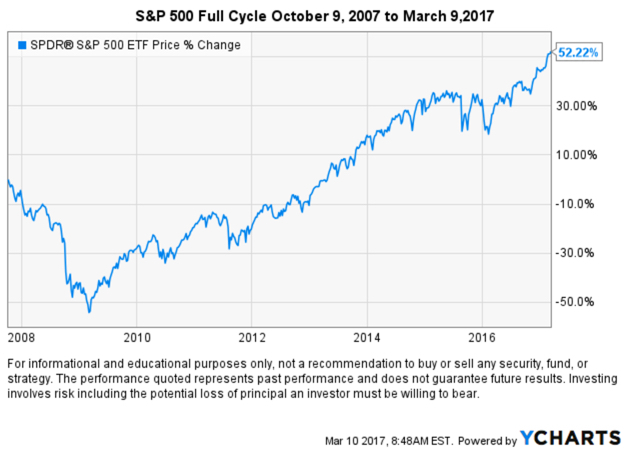 After the low around 2003, a new cyclical bull market began. As we know in hindsight, it lasted until October 2007. 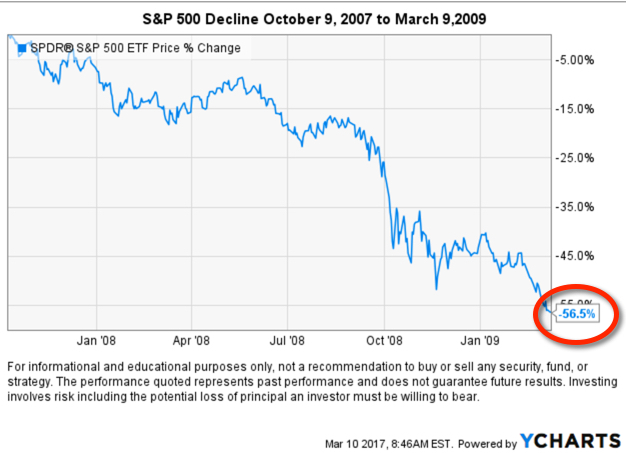 In October 2007, investors were pretty optimistic again and maybe a little euphoric. Stocks had gained over 100% from the bear market low and they wanted more stocks. It didn’t take long for a decline large enough that more than erased all the gains they were so excited about. 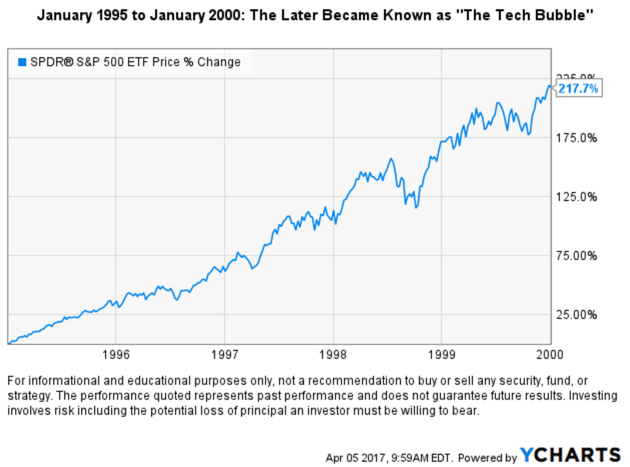 In fact, not only did that bear market erase the gains of the cyclical bull market that started in 2002, it also erased all of “The Tech Bubble” gains going back to 1995! 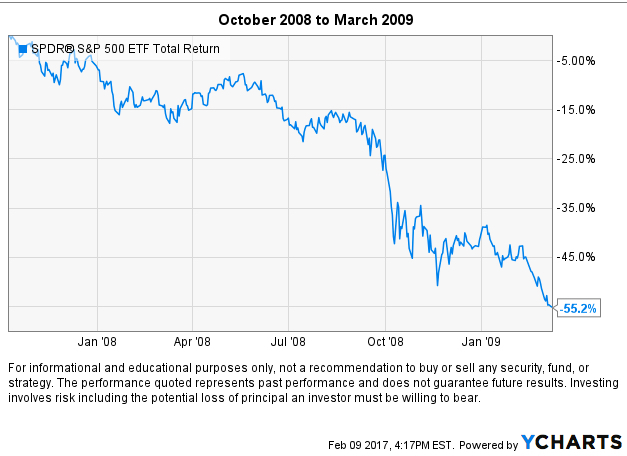 By 2009 the past fourteen years was at a loss for stock index investors. Even the largest uptrends have been erased by the later downtrends. This has happened many times in stock market history. It doesn’t matter how much the stock market had gained. It only mattered if the profits were realized. Otherwise, it was just a rollercoaster. You can probably see why I say that markets have profit potential, but because they don’t always go up, they require risk management. It’s why I actively manage risk and apply directional trend systems intended to capture profits and avoid significant losses. Many studies show that investors have poor results over the long haul including both bull and bear markets. For example, DALBAR has been conducting their annual Quantitative Analysis Of Investor Behavior study for 22 years now. DALBAR’s Quantitative Analysis of Investor Behavior (QAIB) has been measuring the effects of investor decisions to buy, sell and switch into and out of mutual funds over both short and long-term time frames. The results consistently show that the average investor earns less – in many cases, much less – than mutual fund performance reports would suggest. If someone doesn’t save and invest some of their money, they’ll never have a chance to have good long-term results. However, they find the biggest reason for poor results by investors who do invest in the markets over time is investor psychology. Investors tend to do the wrong thing at the wrong time, especially at market extremes. 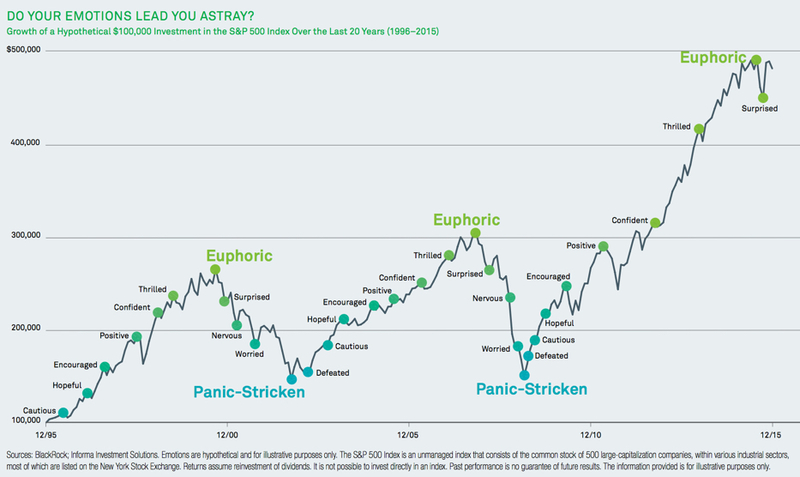 The chart below illustrates how investors tend to let their emotions lead them astray. The typical “bull market” for stocks may last four or five years. After investors keep hearing of rising market prices and headlines of “new highs” they want to invest more and more – they become euphoric. The may get more “aggressive”. However, those gains are in the past. Market trends are a good thing, but they can move to an extreme high (or low) and then reverse. Investors feel euphoria just as the stock market is getting “overvalued” at the end of a market cycle. Look at that chart: what big trend do you think happens next? On the downside, investors panic after large losses. There are many ways that investors get caught in this loss trap. For example, some are told to “stay in the market” so they hold on beyond their uncle point and then tap out. 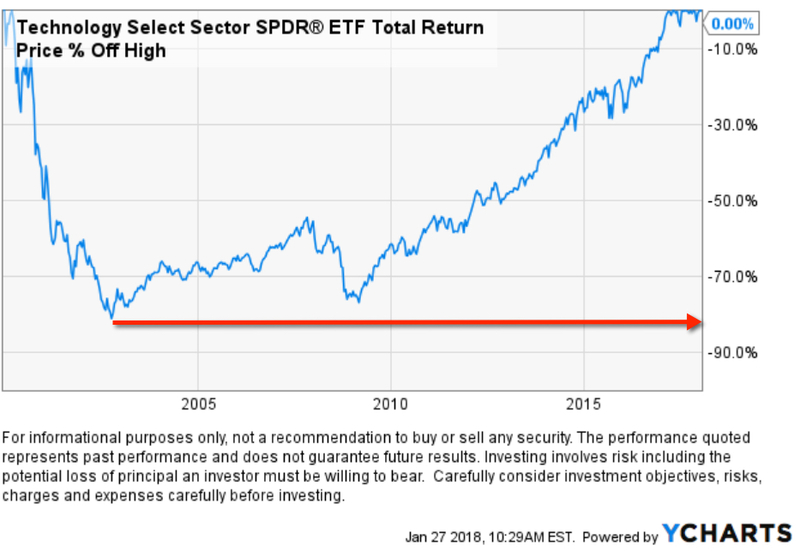 After they sell at much lower prices, they are too afraid to “get back in.” They are “Panic-Stricken.” They don’t discover the actual risk of their passive asset allocation until it’s too late and their losses are larger than they expected. 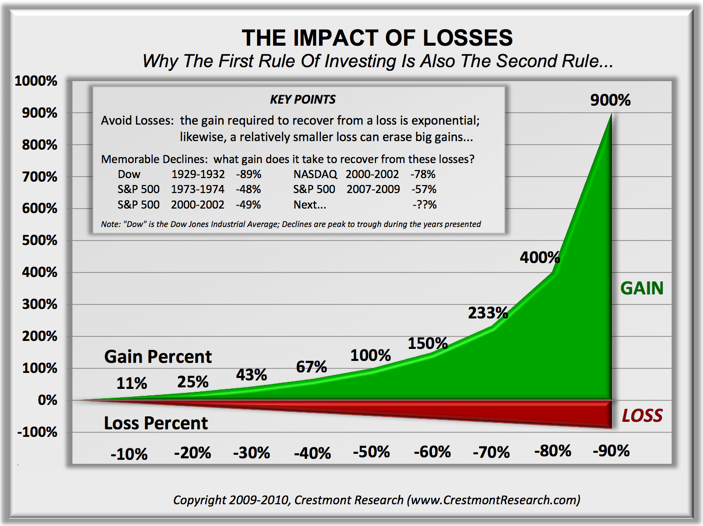 Investors need to know their real tolerance for loss before the loss happens. Then, they need to invest in a program that offers a matching level of risk management, so they don’t lose so much they tap out and lock in significant losses. If they reach their uncle point and tap out, they have an even more difficult challenge to get back on track. 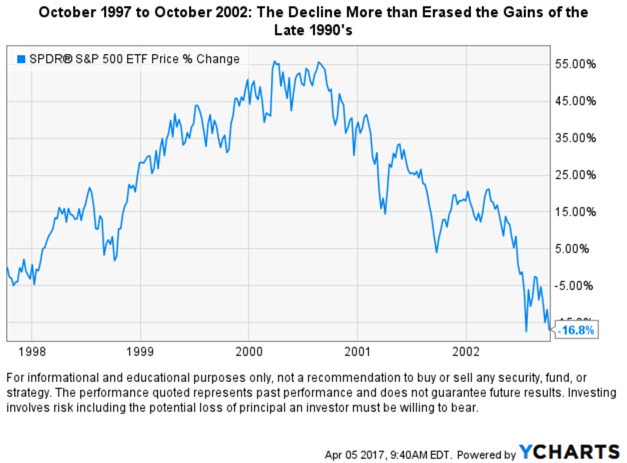 The chart above shows twenty-one years of the historical return of the S&P 500 stock index. Look at the graph above to see the points this happens. It shows an idealized example of investor emotions as prices trend up and down. As prices trend up, investors initially feel cautious, then hopeful, encouraged, positive, and as prices move higher and higher, they feel confident and thrilled to the point of euphoric. That’s when they want to get “more aggressive” when they should be doing the opposite. 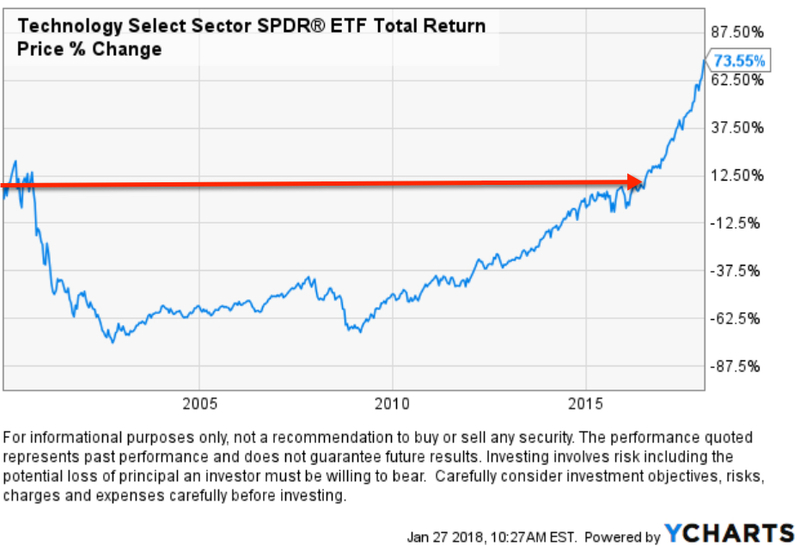 The worst investors actually do get more aggressive as they become euphoric at new highs, and then they get caught in those “more aggressive” holdings as the markets decline -20%, -30%, -40%, or more than -50%. After such investment losses investors first feel surprised, then as their losses mount they feel nervous, then worried, then panic-stricken. But this doesn’t happen so quickly. You see, larger market declines often take a year or two to play out. The most significant declines don’t fall in just a few months then recover. The significant declines we point out above are -50% declines that took 3 – 5 years or more to get back to where they started. So, they are made up of many swings up and down along the way. If you look close at the chart, you’ll see those swings. It’s a long process – not an event. So few investors notice what is happening until it’s well in the past. They are watching the daily moves (the leaf on a tree) rather than the bigger picture (the forest). So, investors get caught in a loss trap because the swings along the way lead them astray. Their emotions make them oscillate between the fear missing out and the fear of losing money and that’s why investors have poor results over a full market cycle. A full market cycle includes a major peak like the Euphoric points on the chart and major lows like the Panic-Stricken points. Some investors make their mistakes by getting euphoric at the tops, and others make them by holding on to falling positions too long and then panicking after the losses are too large for them. At Shell Capital, I manage an investment program that intends to avoid these mistakes. I prefer to avoid the massive losses, so I don’t have panicked investors. And, we don’t have to dig out of large holes. That also necessarily means we don’t want to get euphoric at the tops. I want to do the opposite of what DALBAR finds most people do. To do that, I must necessarily be believing and doing things different than most people – a requirement for good long term results. 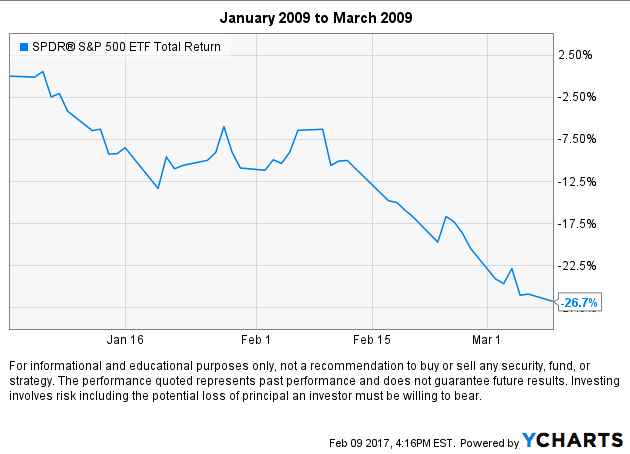 But, creating exceptional investment performance over an extended period of ten years or more isn’t enough. We also have to help our investor clients avoid the same mistakes most people make. You see, if I am doing things very differently than most people, then I’m also doing it at nearly the opposite of what they feel should be done. Our investors have to be able to deal with that, too. Source for the chart: BlackRock; Informa Investment Solutions. Emotions are hypothetical and for illustrative purposes only. 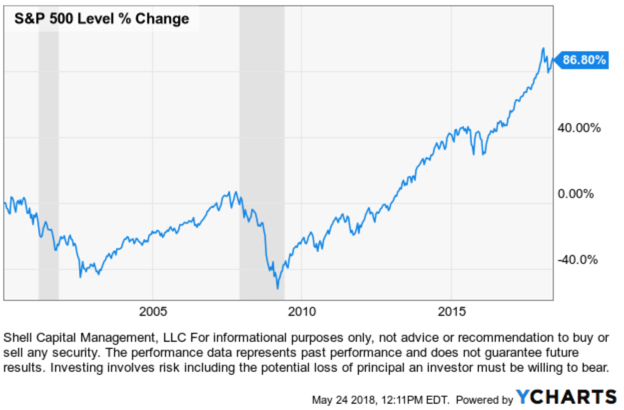 The S&P 500 Index is an unmanaged index that consists of the common stock of 500 large-capitalization companies, within various industrial sectors, most of which are listed on the New York Stock Exchange. 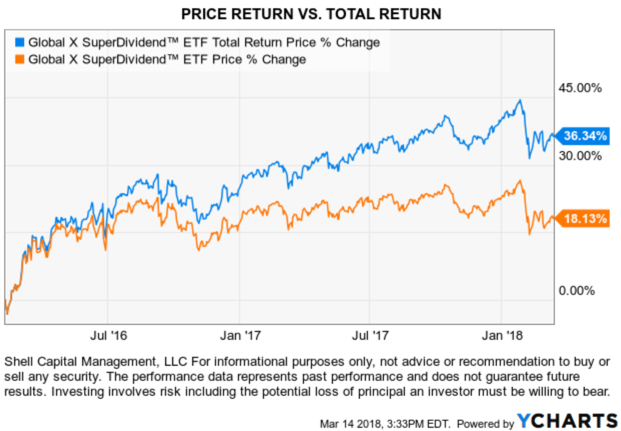 Returns assume reinvestment of dividends. It is not possible to invest directly in an index. Past performance is no guarantee of future results. The information provided is for illustrative purposes only. The problem is many portfolio managers believe they manage risk through their investment selection. That is, they believe their rotation from one seemingly risky position to another they believe is less risk is a reduction in risk. But, the risk is the exposure to the chance of a loss. The exposure is still there. Only the perception has changed: they just believe their risk is less. For example, for the last thirty years, the primary price trend for bonds has been up because interest rates have been falling. 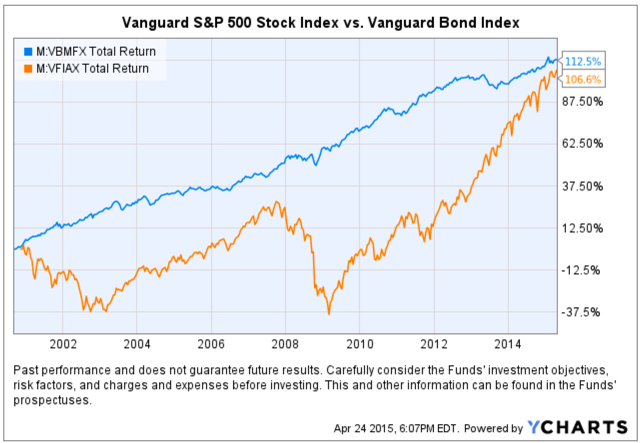 If a portfolio manager shifts from stocks to bonds when stocks are falling, bonds would often be rising. It appears that trend may be changing at some point. Portfolio managers who have relied on bonds as their safe haven may rotate out of stocks into bonds and then their bonds lose money too. That’s not risk management. They don’t know in advance if the position they rotate to will result in a lower possibility of loss. Before 2008, American International Group (AIG) carried the highest rating for an insurance company. What if they rotated to AIG? Or to any of the other banks? Many investors believed those banks were great values as their prices were falling. They instead fell even more. It has taken them a long time to recover some of their losses. Just like tech and telecom stocks in 2000. 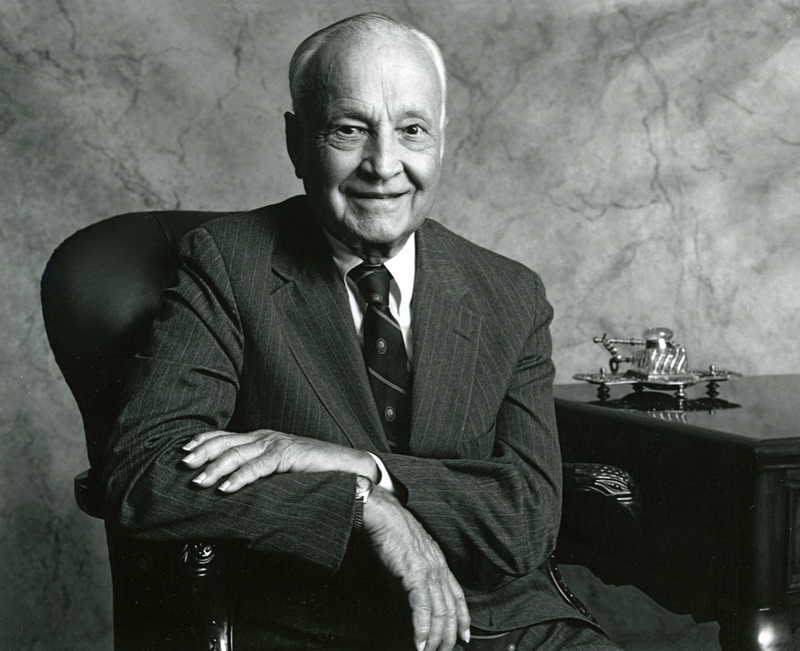 All risks cannot be hedged away if you pursue a profit. If you leave no chance at all for a potential profit, you earn nothing for that certainty. The risk is exposure to an unknown outcome that could result in a loss. If there is no exposure or uncertainty, there is no risk. The only way to manage risk is to increase and decrease the exposure to the possibility of loss. That means buying and selling (or hedging). 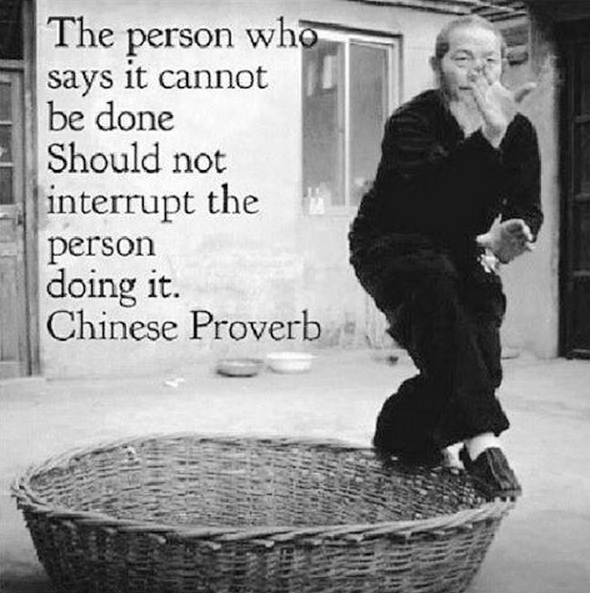 When you hear someone speaking otherwise, they are not talking of active risk management. For example, asset allocation and Modern Portfolio Theory is not active risk management. The exposure to loss remains. They just shift their risk to more things. Those markets can all fall together, as they do in real bear markets. I made bold the parts I think are essential. If you are like-minded and believe what we believe, contact us. When someone asks me why I hold so much cash or against a market decline, it always corresponds to extreme optimism readings in the most basic investor sentiment indicators. Investors have poor long-term results because they feel the wrong feeling at the wrong time. 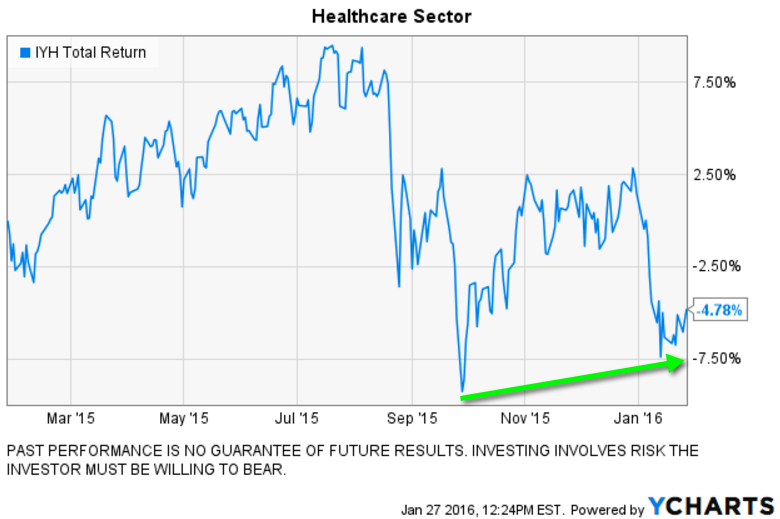 They feel optimistic after price gains just before they decline. They fear more losses after they hold on to losing trends, and their losses get large. 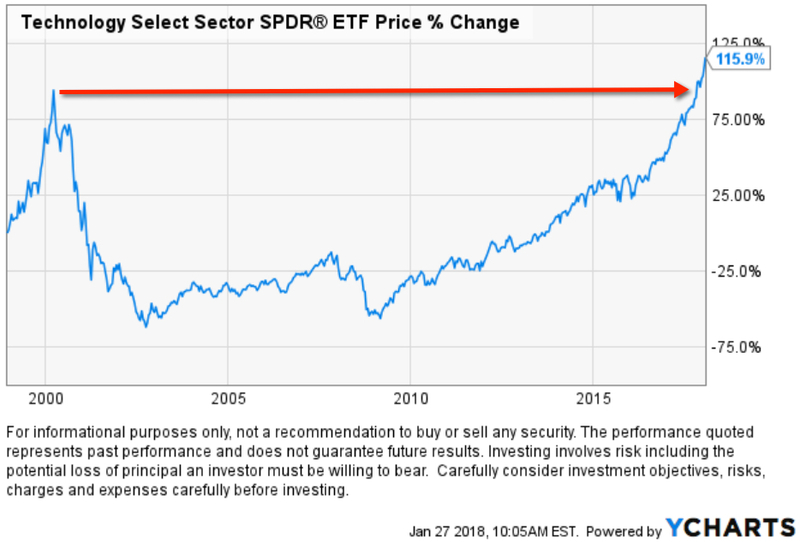 After the stock market declined and then reversed back up to make headlines investor sentiment has reached the level of “Extreme Greed” once again. 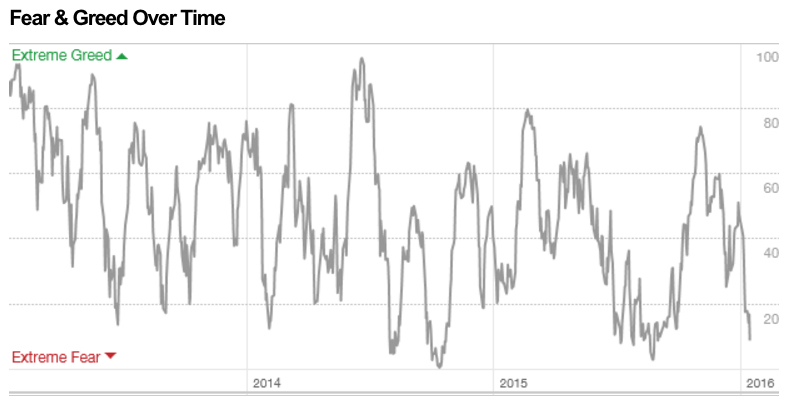 I don’t use the CNN Fear & Greed Index as a trading signal as my systems focus on other things, but I think it’s a publically available source that is useful to help investors avoid feeling the wrong feeling at the wrong time. 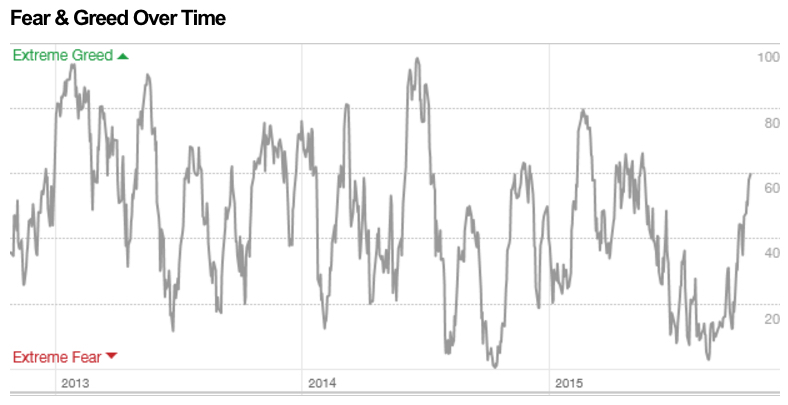 For example, the CNN Fear & Greed Index uses eight indicators of investor sentiment to determine Fear or Greed. The reading oscillates between Extreme Fear, Fear, Neutral, Greed, and Extreme Greed. If you feel optimistic about future prices and the reading is at Extreme Greed, you are probably wrong. If you feel fearful about future prices and the reading is at Extreme Fear, you are probably wrong. You see, most investors feel the wrong feeling at the wrong time. As you see below, it has reached the “Extreme Greed” point, and that often signals high risk and eventually precedes at least a short-term trend reversal. Below is a chart of the past 3 or so years of the Fear & Greed reading. 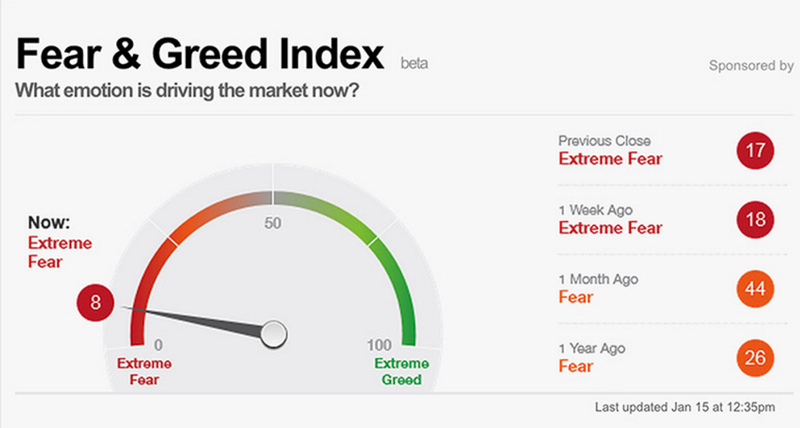 As you see, the levels of fear and greed do indeed oscillate from one extreme to the other over time. I think we observe these readings indicate the wrong feeling at the wrong time. The most obvious extreme level is the extremely low level of expected future volatility. 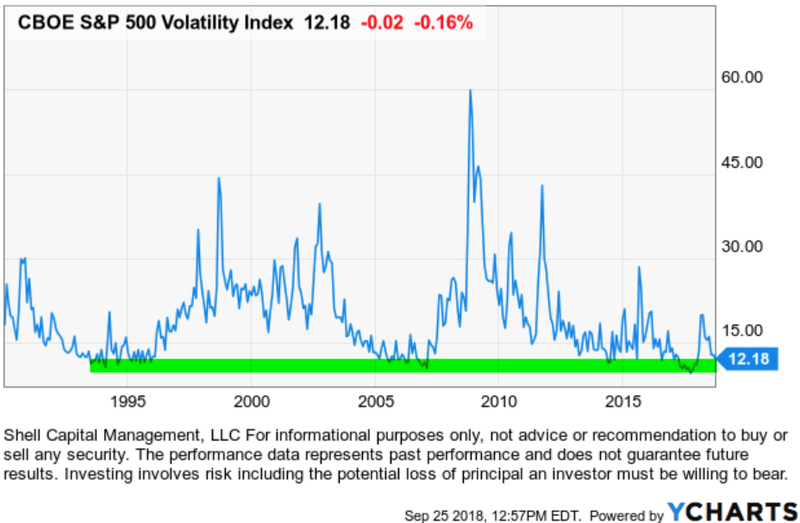 Maybe they are right, but when the VIX Volatility Index reaches such as extreme low it often signals at least a short-term stock market peak that reverses down. I like directional trends, but I also believe they sometimes reach extremes at a point and then reverse. 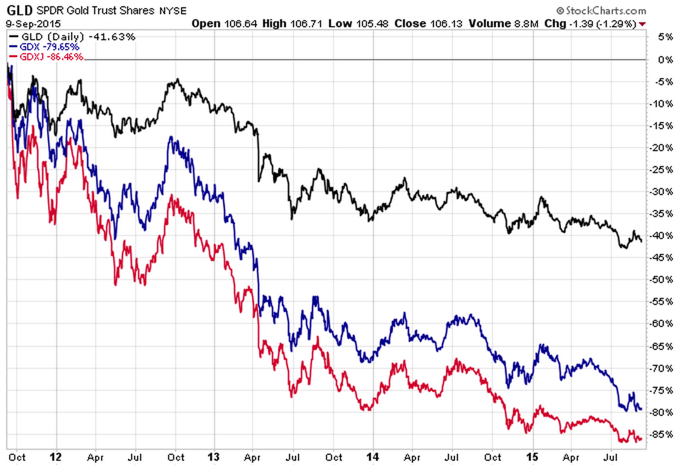 You can probably see why it’s prudent to actively manage risk and hedge at certain extremes. Every new moment is necessarily unique – we’ve never been “here” before. Probabilities and potential payoffs change based on the stage of the trend or cycle. For example, the current decline in stocks is no surprise, given the stage and magnitude of the prior trends. A few see evidence of the early stages of a bigger move, others believe it’s different this time. We’ll see how it all unfolds. I don’t have to know what’s going to happen next – I am absolutely certain of what I will do given different conditions. Human judgment, good and bad, will drive investment decisions and financial-market outcomes for the rest of our lives and beyond.